This article is about medical terminology. For other uses, see Malignancy (disambiguation). 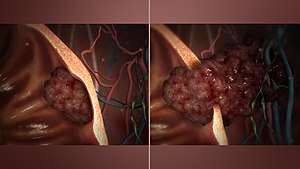 Malignant tumor (R) spreads uncontrollably and invades the surrounding tissues, unlike benign tumor (L), which remains self contained from neighbouring tissue. Look up malignancy in Wiktionary, the free dictionary. ^ Tuna M, Amos CI (November 2013). "Genomic sequencing in cancer". Cancer Lett. 340 (2): 161–70. doi:10.1016/j.canlet.2012.11.004. PMC 3622788. PMID 23178448. ^ Swanton C (October 2012). "Intratumor heterogeneity: evolution through space and time". Cancer Res. 72 (19): 4875–82. doi:10.1158/0008-5472.CAN-12-2217. PMC 3712191. PMID 23002210.